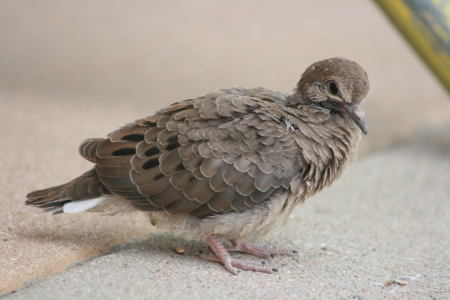 This little guy was hanging out by the rockpile gate when I arrived. I arrived about 45 minutes before the gates opened and was the first person in. After heading in I ran straight for the pavillions for batting practice. It started a little slow and I did not get anything from the Rockies. With in the first few minutes of Mets BP I picked up my first ball that rolled landed in a section with out many people. Then I got my second on a catch. I also caught the last ball of BP off the Mets, it was the first BP that I had gotten 3 bp balls from a single team and the third time I have gotten 3 balls in a single BP. That is 4 for the series all four from the Mets but I have always done well when the Mets have been in town. 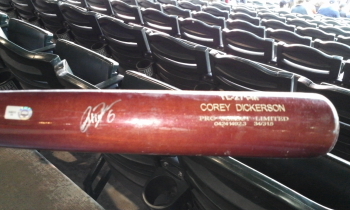 So once again I headed to the Mets side of the field for autos. I headed down with a couple of friends I knew from NY who had never been down to the wall before. I ended up getting a Jose Reyes card signed. The above photo is of the Rockies during the National Anthem. 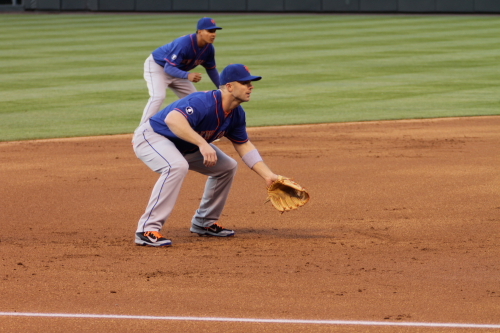 Ike Davis and David Wright throwing before the game. 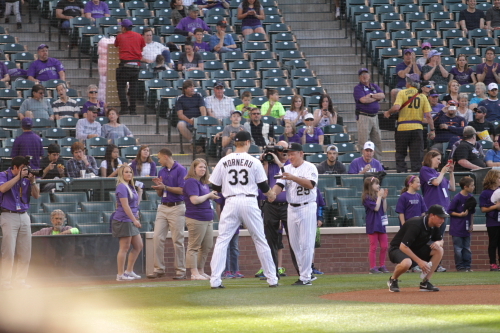 The Rockies Take the field to start the game. 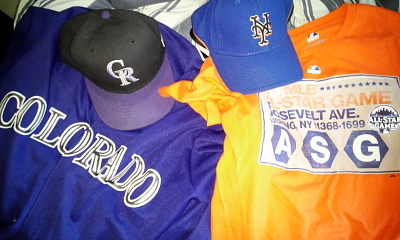 The Starters for this game was Jason Hammel for the Rox and Mike Pelfrey for Da Mets!!! 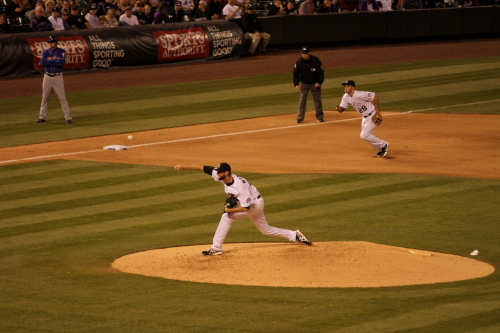 Jason Hammel Pitching to the lead off batter Jose Reyes who hit a double. It took a while for Hammel to settle in after letting up a hit to Reyes, Daniel Murphy hit a single David Wright got out and Carlos Beltran was walked. 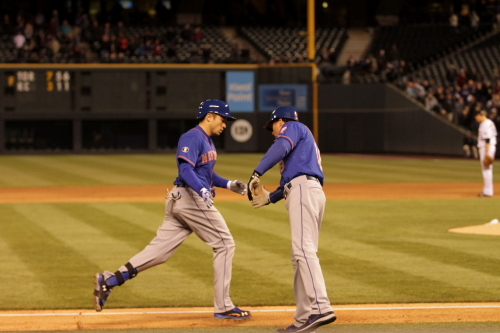 Ike Davis would hit a single and score both Reyes and Murphy. Carlos Beltran takes a ball before walking in the first. 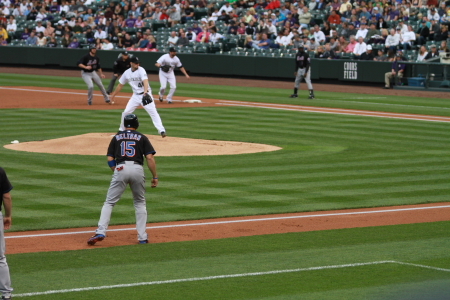 Jason Hammel pitching to Jason Bay, with Ike Davis on 1st and Carlos Beltran on 3rd. 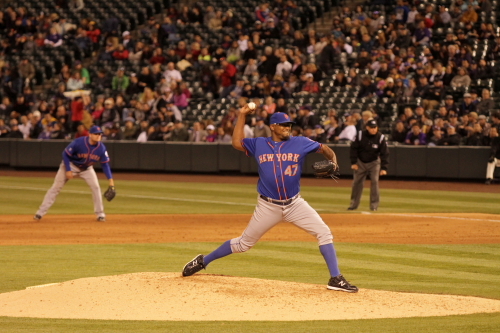 He would then strike out Bay and the catcher Ronny Paulino to end the inning. The Rockies would go down in order in the 1st. Mike Pelfry pitching to Dexter Fowler. 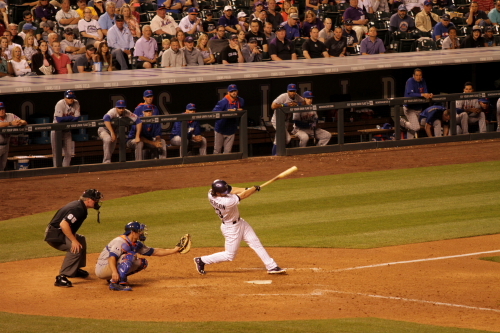 Carlos Gonzalez taking a strike. It is time to play where is the ball in the photo! 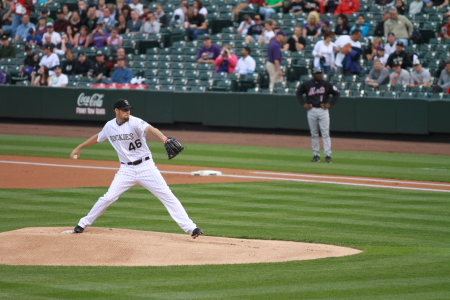 The 2nd inning Hammel seemed to settle down very well striking out the first batter Jason Pirdie. 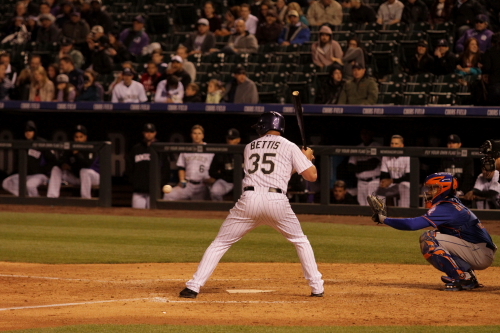 Pelfry would ground out and Reyes hit one to Seth Smith to end the inning. 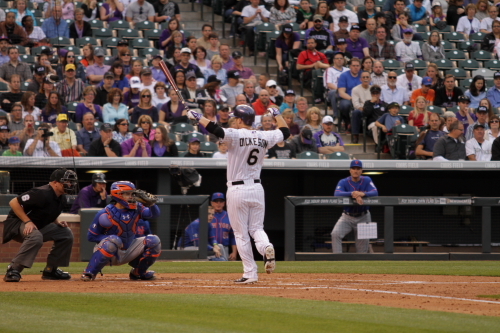 The Rox would come up in the second and The Deuce would lead off the inning with a solo shot to right. 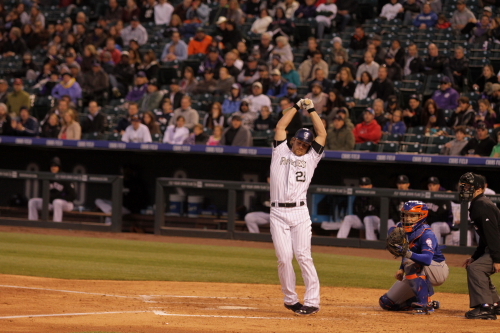 Helto would grund out and the Seth Smith would hit a solo shot of his own to tie the game 2-2. 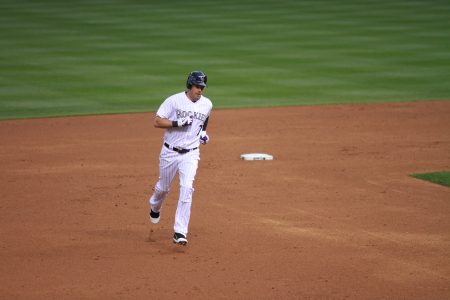 The Deuce heading to third after his 2nd inning lead off Homerun. 2 Batters later Seth Smith doing the same. 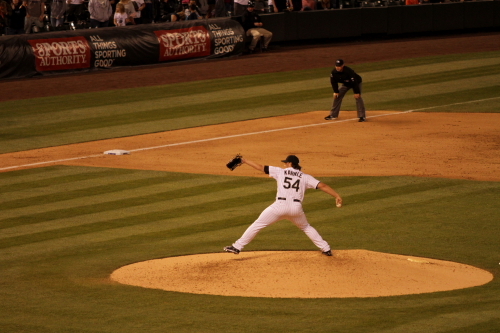 The 3rd inning both teams went down in order Hammel struck out Wright and Pelfry struck out Dex. In the 4th inning jaso Hammel was hit in the leg by a Ronny Paulino grounder which got him on base and would later score on a Mike Pelfry double. Yes, you did read that correct the pitcher got a double. 4-2 Mets. 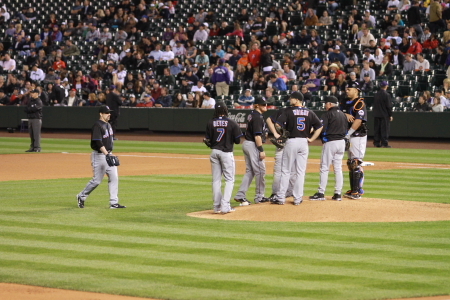 Hammel did complete the inning but did not pitch as well after being hit. 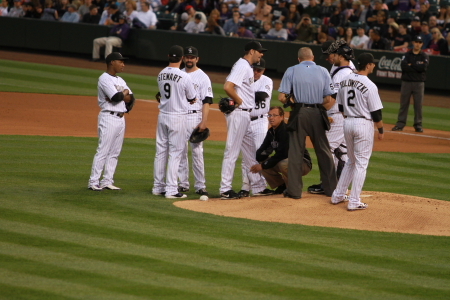 This is the coaches and trainers checking out Hammels leg. Taking a practice throw while Manager Jim Tracy and Bob Apodaca look on to evaluate if he was ok to stay in the game. 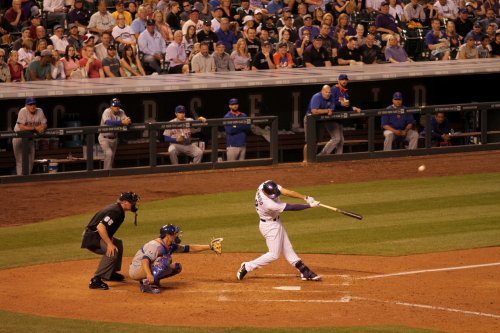 In the 6th inning Cargo hit a solo HR of his own. 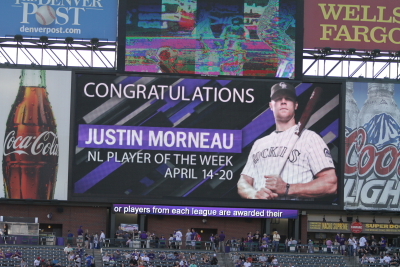 Which was his first at Coors this year. Hopefully this is the end of his hitting slump. 4-3 Mets. 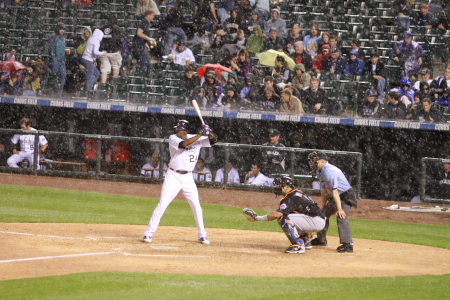 In The 7th With 2 out Dexter Fowler was at the plate when it started to pour he had 2 balls 2 strike when the rain delay was called all in all it was a 50 something minute at bat. 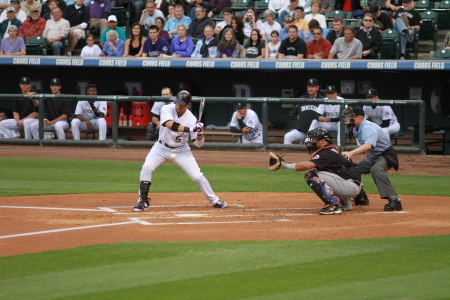 Dexter right before he waits for the last pitch. 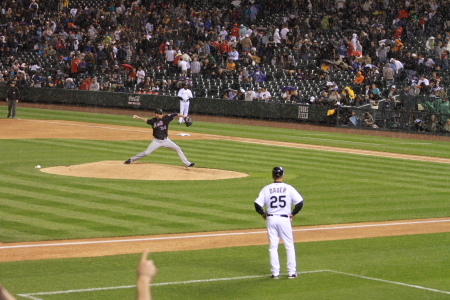 Mike Pelfry throws the last pitch to Dexter Fowler. 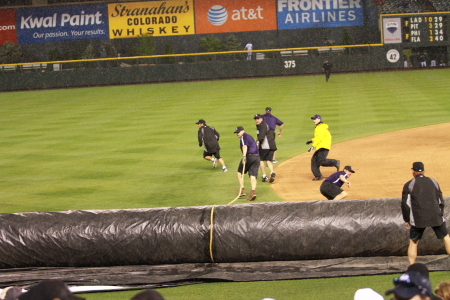 The Coors Field growns crew pulling the tarp. After a while they removed the tarp and it was time to play ball once again. During the rain delay I hung out under the Rockpile knowing it was going to be less crowded then the concource. 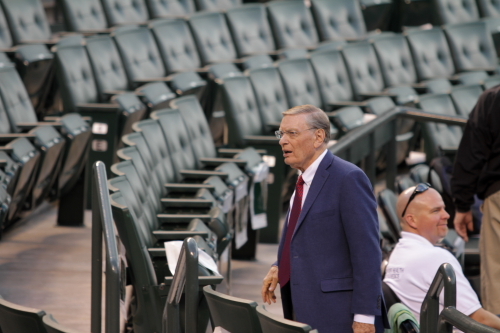 Then we headed back to our seats or should I say where we were sitting. While I was down at the wall before the game one of my friends ran into someone he worked with who had 2 tix in section 142 so I stayed their figuring I would leave when the section filled in since my seats where just a few sections away. Well the section did not fill in, so I watched the full game from there. After the delay Dexter Fowler returned to the plate and fouled a ball of his knee and then Ryan Spilbourghs pinch hit for him. Coming up with the count Dex left before the rain delay. 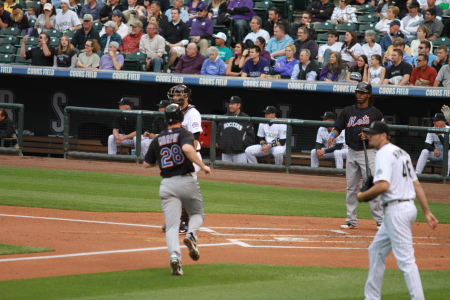 He then walked but was left on base when Jonny Herrera struck out. 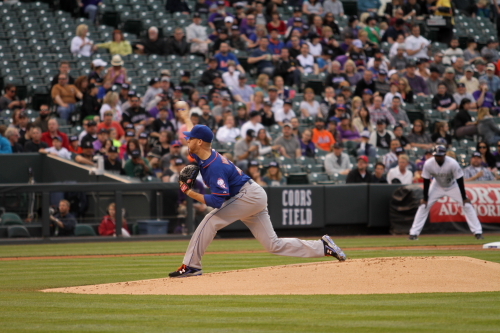 After Ingringhaus pitch for the Mets after the rain delay, Tim Byrdak came in to pitch in the 8th. 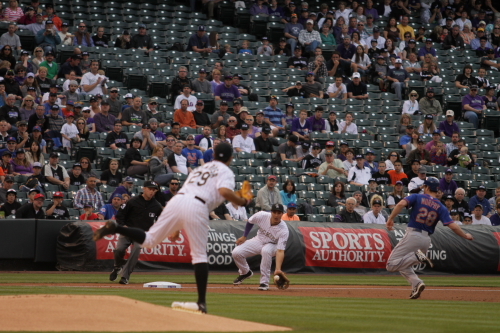 second basmen Justin Turner throws to Daniel Murphy for the final out of the game the Mets won 4-3. 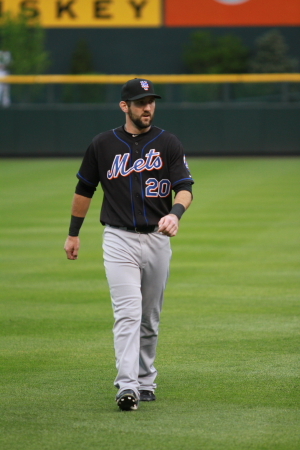 Turner came in when Ike Davis Colided with David Wright turning his ankle. Daniel Murphy went to 1st and Turner played 2nd. 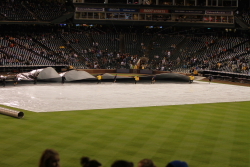 It was along night at Coors Between a rough loss and a rain delay. 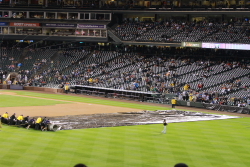 The 3rd game of the series has been also delayed 1 day as of now and is scheduled for the 12th at 1:10. Hopefully I will make it but I am scheduled to work. Maybe it will be delayed long enough so I can get their after 2 to see the game. If not then I will be at sundays game against the San Diego Padres. After about an hour and a half there we headed up to get our tickets neither of us had tix for this game previously. Then we headed to gate E to head into the stadium. When the gates opened we headed for the outfield to try to snag some BP balls. It was kind of a slow batting practice not to much was hit out I had a shot at one of the Rockies that I think went threw my glove or tipped of the top. 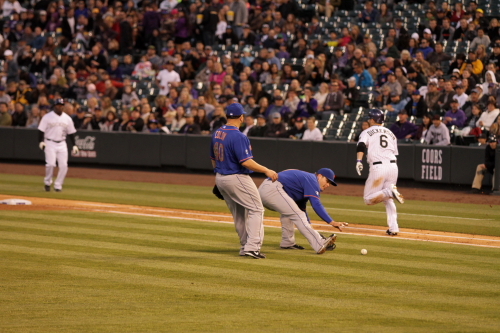 Then I got a bouncer off the track during the Mets BP. Within about a minute of getting that ball I noticed Mookie Wilson signing autographs by centerfield so I headed over and had him sign the ball it was realy cool meeting him since I grew up a Mets Fan during the mid 1980’s. You may remember Mookie Wilson was the player who hit the slow roller to Bill Buckner in Game 6 of the 1986 World Series. After BP I changed up alittle bit and headed to the Mets side of the field to see if I can get some autos since the Rockies haven’t signed much before games this season. Only a Mets coached signed but I did not get his autograph. Geoff also headed over to the Mets side to try to get a ball signed that he caught last season. 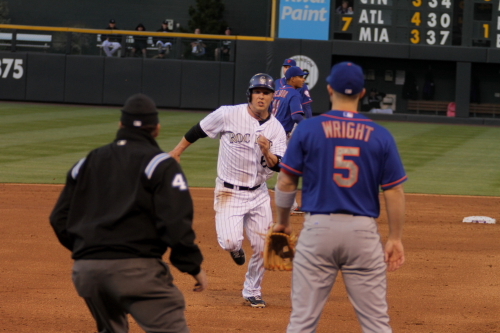 The ball was hit by David Wright and it was his 143rd career HR. Neither of us got any autographs. Mets Catcher Josh Thole heading to the Bullpen. The hosers from the opposite side of the field. Rockies Jhoulys Chacin long tossing in the outfield before the game. 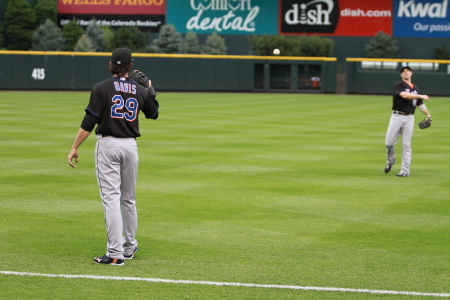 Mets Centerfielder Jason Pridie, 1st baseman Ike Davis and Shortstop Jose Reyes during warm ups. 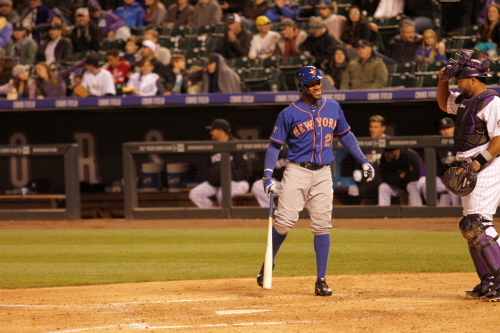 Jose Reyes taking some swings during warm ups. Looks like the Mets have pinkies also. Having the Rookie member carry a pink backpack to the bullpen. 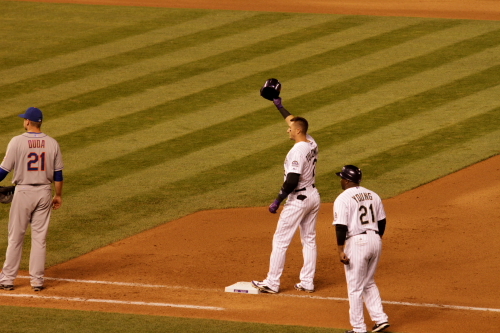 The Rockies have them also do this usually with a Dora the Explora backpack. Tonight my seats where at the top row of the pavillions but I stopped and chatted with Judy and Anna who had seats in section in the 2nd row of 152. 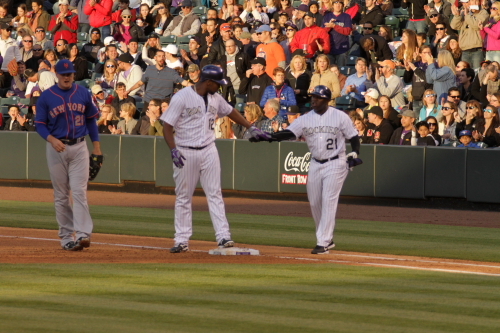 This is a photo of the Rockies heading to the field. 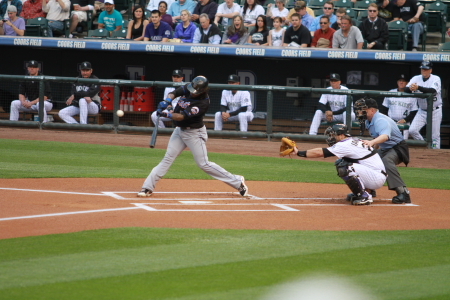 Chacin throwing to Jose Reyes in the first inning, Reyes tried to bunt on this pitch but unsuccesfully. He ended up grounding out to Chacin. in the 1st the Mets went down 1,2,3. 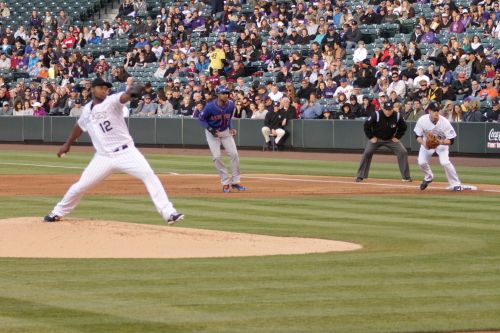 The Rockies 1st looked promising, Dex leadoff with a walk. 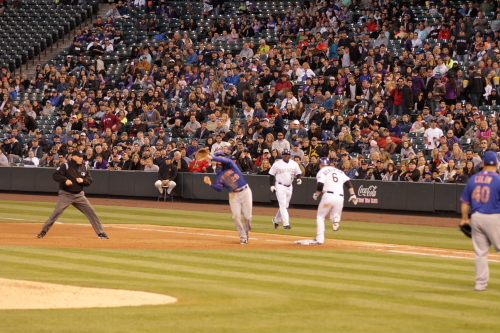 Followed by a Herrera single then Cargo’s batting woah’s countinued when he struck out. The Deuce did hit a single then Helto hit into a double play. The Mets sent 5 batters up in the 2nd resulting in no runs and Chacin iwho did not have his best performance walk 2 in the inning. Both teams went down in order in the 3rd. 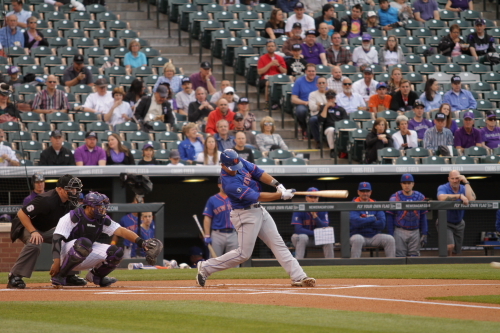 Jose Reyes grounds out to Jonny Herrera in the 3rd inning. 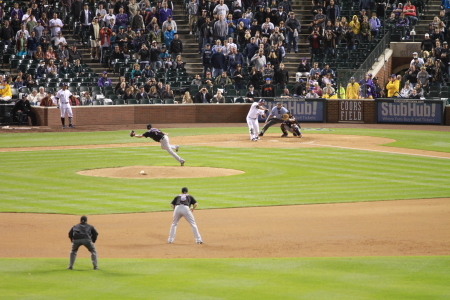 Cargo makes a catch in the 4th inning of a David Wright hit to left center. 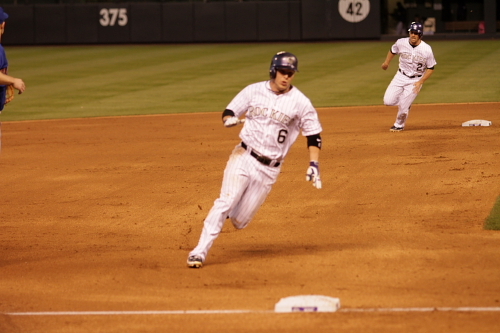 The game was very uneventful for most of the game the first run wasn’t scored until the 5th inning. 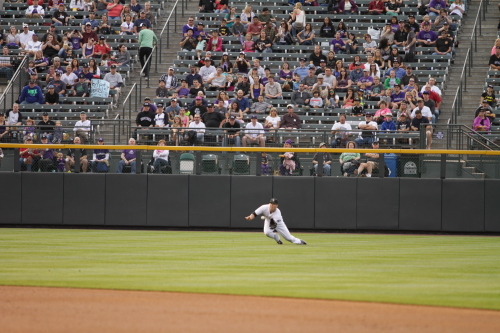 Chris Iannetta lead off the 5th with a double. Ian Stewart stuck out Chacin growneded out to short. 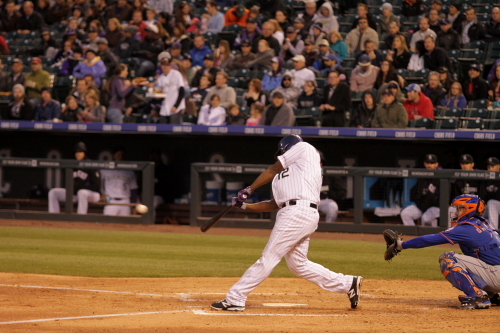 With 2 outs Dex hit a single scoring the Iman from 2nd. 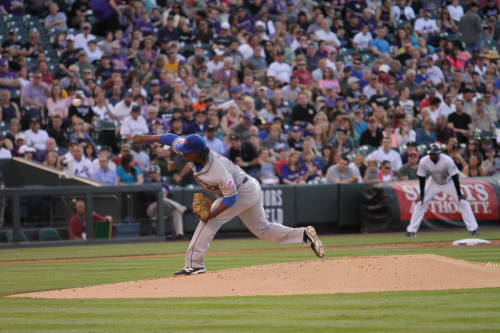 Herrera the ended the inning with a hit to the Mets 2nd baseman Daniel Murphy that got Dex out at 2nd. 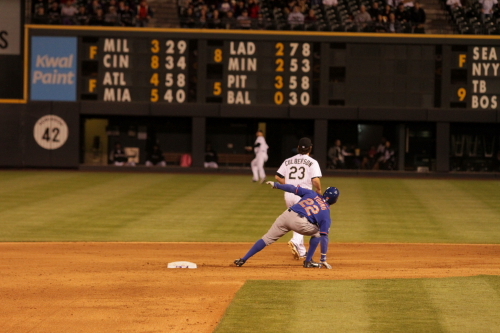 The Mets would responed with a run of their own 6th. When Carlos Beltran lead off with a walk and later scored after a very sloppy inning by the Rox Chacin walked 2 in the inning andIan Stewart had a throwing error to first which pulled Helton off the bag. Chacin managed to get out of the inning that could of been alot worse. That run tied the game at 1 of piece. Then after a Seth Smith ground out to 2nd Chris Ianneta stepped to the plate with the swing he has when he is trying to accomplish something. 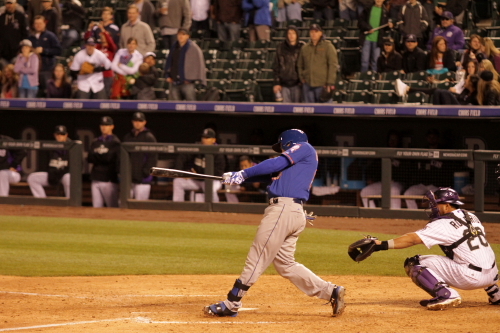 The Mets have seen this swing before when he hit a walk off against them last year at Coors. Well this year it wouldn’t be a walk off HR but a game winning HR in the 7th. 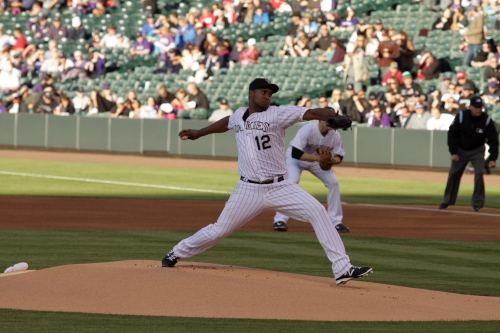 Making the game 2-1 Rox and that was all that was uneeded for the night. The Mets went down in order in the 8th and 9th. 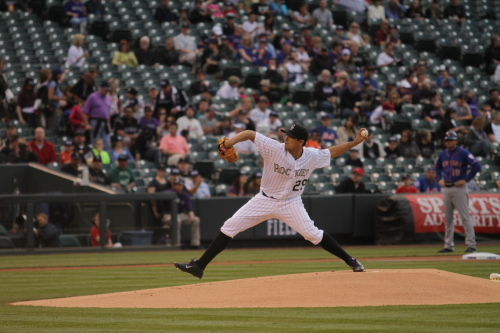 Chacin ended up pitching 6 and the bullpen back him up well for the last 3. Reynolds and Belise got threw the 7th well and Bettancourt was on his game in the 8th. Jason Pridie catches a Ian Stewart fly to center in the 7th. 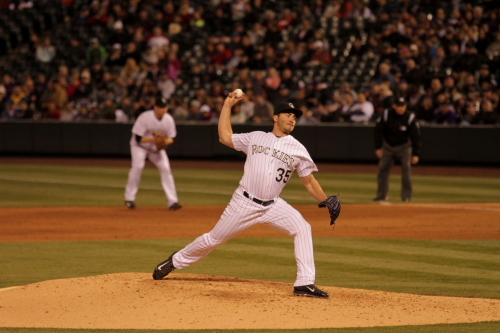 Taylor Buchholz heading to the mound for his first appearance since leaving the Rockies late last season. 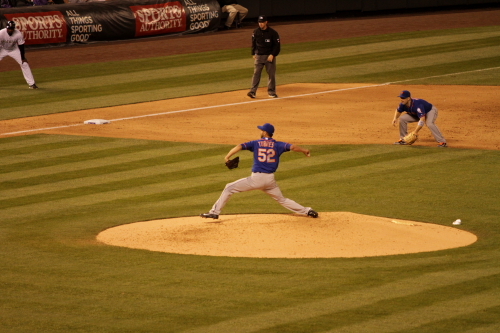 Taylor Buchholz pitching to Dexter Fowler in the 8th inning. 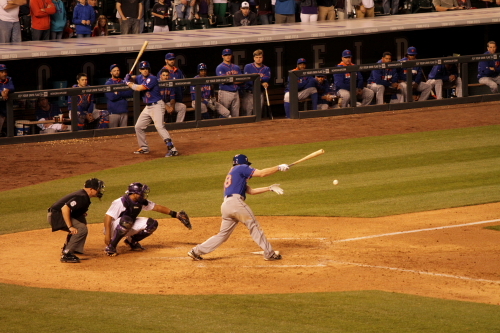 The Deuce making the final out of the game hit by Daniel Murphy. 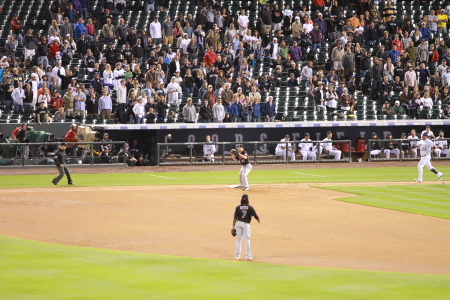 Diving after the graound ball then got up to throw it to Helton for the final out of the game and the Rockies won 2-1. 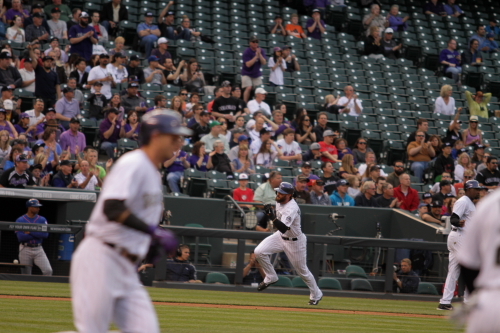 The Rockies running to the field to celabrate their win. Love the Iman fist pump. Once again the Rockies Fans celabrate at the Root sports post game desk. Gary X and I got to toss out the T-Shirts for Helmer again i was late so Gary threw out most of them but left one for me to toss out. This guy definatly has the best hair of the game. Tottally forgot his name but see himm at a lot of games. Tom Helmer firing up the crowd. Banner Jack was out celabrating the win this night also. It was cool to learn he is also from NY when I watched the replay of the game later that night. After the game Gary X and I headed out to the players exit and Ian Stewart stopped to sign a few for the fans out there. It was cool of him to stop glad to see him back and would love to start hitting like the 2009 Ian Stewart. As i write this he is hitting .064 for the season and has already been down to Triple AAA, where he was totally Rocking in his games with them. Well thats it for this one. Check back for Mets game 2 and possible the rain postponed game 3 if I can get out of work!!! Also maybe the lost may 1st post will magicly appear. sometime soon some great photos in that one with a special guest photographer who will that be? bTill then See you at Coors. Part 2 of MY 2010 Road Trip What a Rocky Road it was. This is the 2nd part of my 2010 Road trip it starts at the second game I attended at Citi Field in NY on August 11, 2010 to a Game I attended in Indianapolis on August 16, 2010. While I was getting ready to head to the train station to the stadium my phone rang and it was Zack Hample. 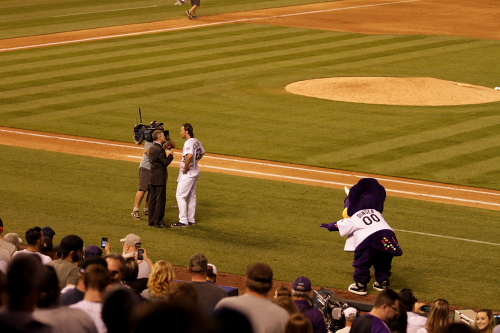 My friend Robert from Coors Field told him I was going to be in town and we should meet up. Zack said he would meet up with me before the game. Zack only stuck around for BP. This was a few days before his most recent books deadline. Zack has his own blog The Baseball Collector. 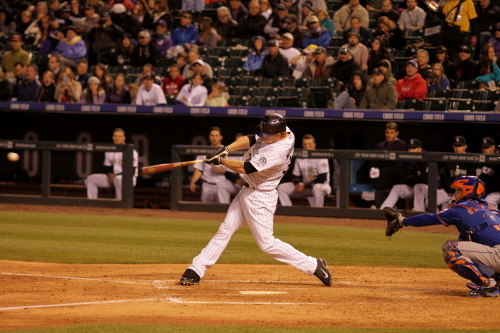 Heres a link http://snaggingbaseballs.mlblogs.com/. 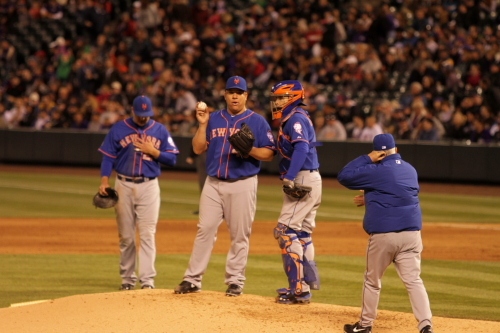 It was realy cool meeting him and the rest of the Citi Field Ball Snagging crew. Here a photo of the group of us outside Citi Field. 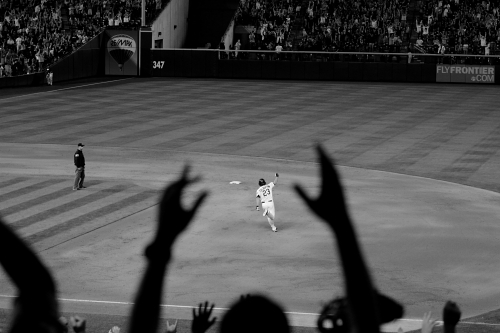 An below that a photo of Zack in Left Field Seats. 1) Greg Barasch, who recently joined the 1,000-ball club. 2) Gary, who has some pretty impressive stats of his own. 3) Brian (aka “puck collector”) who’s not too far behind Gary. 5) Mateo, my Watch With Zack client from 7/27/10 at Citi Field. 6) Mike from Denver. I had just met him through a mutual friend: Robert Harmon of 762 fame. 7) Brian’s father Wayne (aka “father puck”) who’s holding up his copy of the new Sports Illustrated article about Zack. Mets pitches warming up along the 3rd base line during BP. A few minutes after this photo was taken. I caught a ball that was fouled off and bounce on the warning track and into the stands. 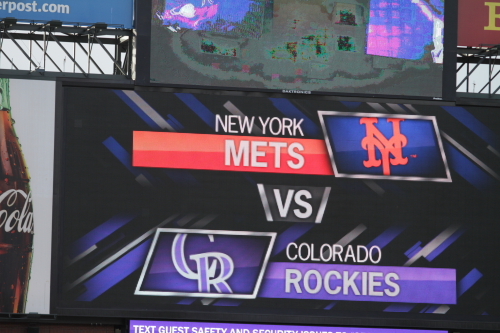 A look at the 2 LED scoreboards they have at Citi Field. A view of Citi Field during warm ups before the game. 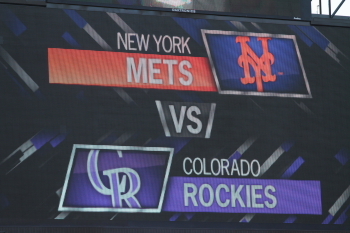 The starting line ups for The Aug. 11th game between The Rockies and Mets. Both Pitches heading to the dugout after pre game warm ups in the bullpen. 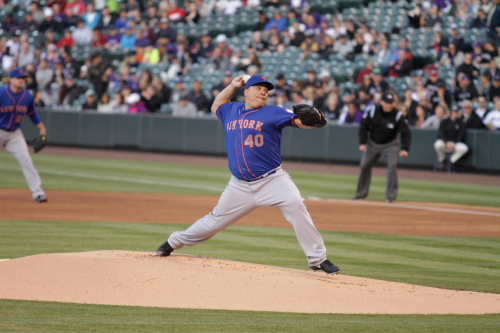 Starting Pitchers were Jeff Francis for the Rox and Jonathan Niese for the Mets. Jonathan Niese throws 1st pitch to Dexter Fowler. Jeff Francis throws his first pitch to Mets Short Stop Jose Reyes. Mr. Met visits the upper deck and trows out a few tee shirts to the fans. A photo of Citi Field during the 4th inning. 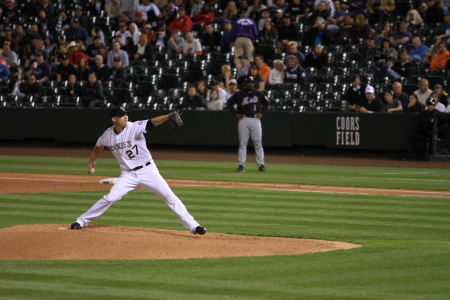 Jeff Francis Pitching in the 4th inning. 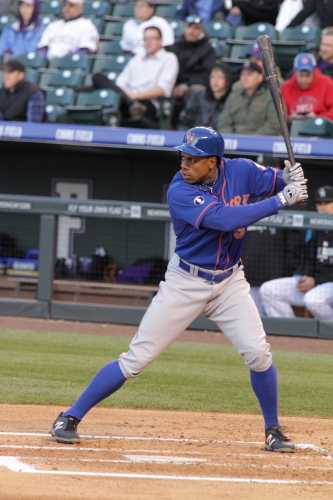 The Mets 2 runs were scored in the first inning by an Angel Pagan 2 Run HR. 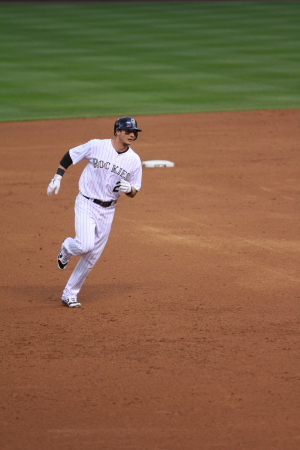 The Rockies 1st Run was score by a Chris Iannetta Sac Fly to center scoring Tulo in the 7th at that point it was 2-1 Mets. 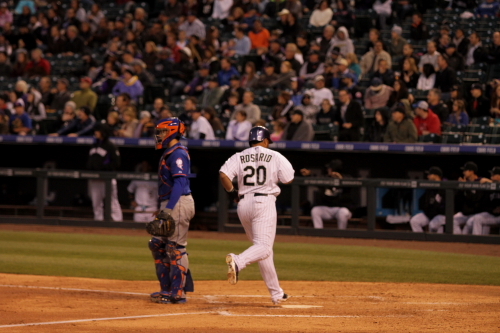 Melvin Mora rounds 3rd after hitting a 8th inning Grand Slam Home Run, Scoring Helton, Tulo and Cargo. 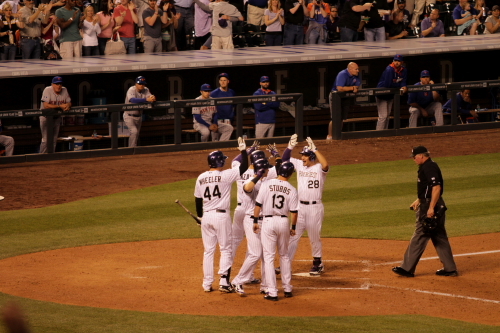 Tulo Crosses the plate for the 3rd run from Mora’s HR. 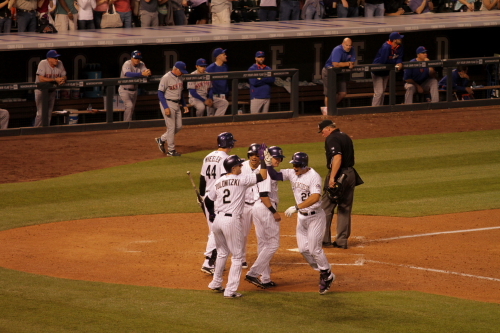 Cargo high fives Melvin Mora after his trot around the bases. 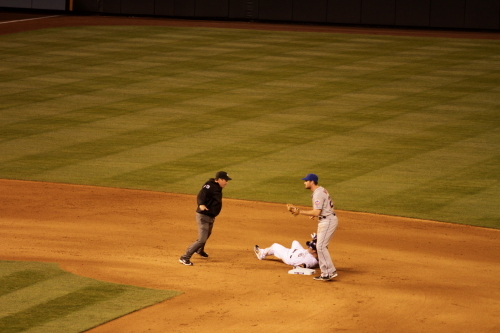 Dexter Fowler make final out hit by NY Mets Centerfielder Carlos Beltran. The scoreboard at the end of the game. 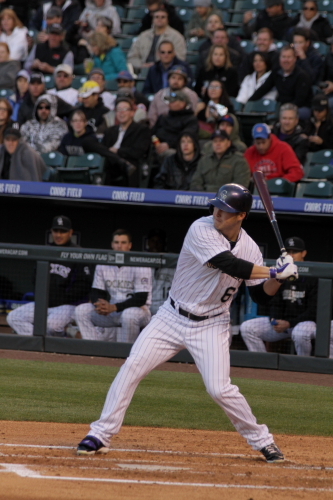 The Rockies Win 6-2.After the Mora Home Run Clint Barmes single scored Brad Hawpe. Bringing the score to the 6-2 final. 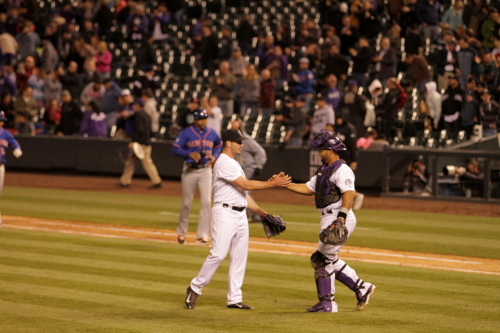 Rockies celabrate their 6-2 win over the Mets. The Rockies winning did make the train ride back to the Island a lot easier. Everybody on the trains were very cool and realy intrested about Colorado and the Rockies. 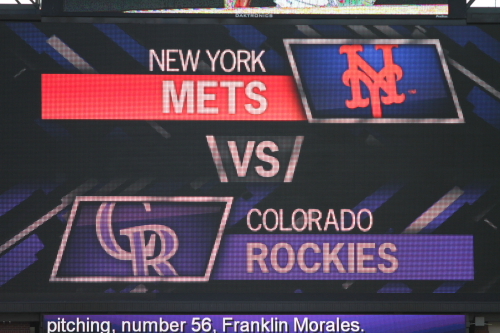 A few even said how “The Rockies have a very good team and the Mets need some work”. Not my Words that was from a Mets fan on the train. Had a lot of fun and good conversations on baseball. That day a very unusual thing occured. Do to a late start from LI and NY traffic we got to the game in the 2nd inning the Rockies were already down 2 runs when we got there. 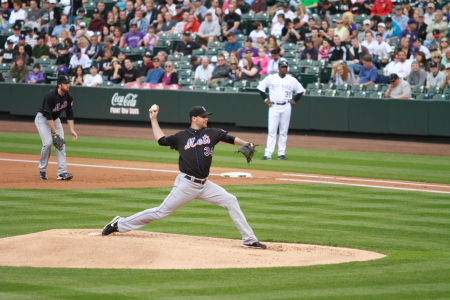 Above is Jason Hammel Pitching in the 3rd inning. This is a view from My seat on the left field side of the stadium. Thanks to Mike M for the great tickets that also included acces to many of the clubs in Citi Field which is where we spent most of the game. It was realy cool to see things I normaly do not see at stadiums. 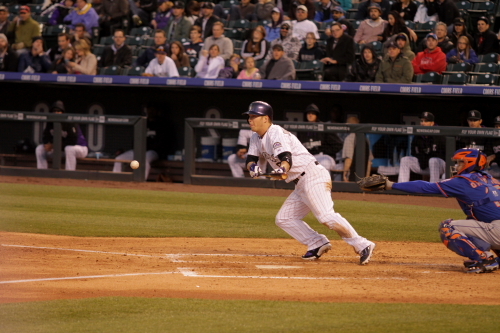 especially with such uneventful game for the Rockies. This was the day after Mets closer Francisco Rodriguez was arrested outside the Mets clubhouse for punchinhg his father in law. Here is a fan showing support for him. A view of the Jackie Robinson Pavillion from the inside of Citi Field. The scoreboard at the end of the game the Mets Won 4-0. That evened the 6 games the 2 teams played this year to 3-3. It made the Rockies 3-4 on this road trip and 1-3 with me in attendance. Some would say it was a rocky road trip. The Indians are the triple a affiliate of the Pittsburgh pirates. Another one for the Ranter. Can’t be a baseball game with out the hosers. A view of the Stadium from the birm in right field. A sign hanging over the concourse. The centerfield wall celebrating the Indians being at Victory Field 15 years. A view from my seat on the 3rd baseline in the 5th inning. Thanks Chris for the tickets. The scoreboard at the end of the game was not a good one for the Indians losing to the Chiefs 11-4. This game was definatly not a pitching battle. Here is a view of Victory Field after the game outside the center field gates. After all the games I was going to attend were done I had one more piece of baseball history to check out. It is an old abandon stadium on the outskirts of Indianapolis. This stadium was the old home of the Indianapolis Indians. Bush Stadium was built in 1931 by the Indians owner Norm Perry and was called Perry Stadium During WWII it was renamed Victory Field. After the stadium was sold to the City of Indianapolis it was renamed after a MLB baseball player Donnie Bush. It remaned Bush Stadium till the Indians moved to there new stadium in Downtown Indianapolis Victory Field. Some of the masonary work on the front of Bush Stadium. Outside wall of the stadiums 1st baseline.Covered in Ivy. Bush stadium. In 1987 the field was also used in the movie eight men out. Where it was used to depict Cominsky Park and Crosley Field. The back of the center field wall and old scoreboard. My first look of the field after a peek through a gate that was in left field. To my suprise there were hundreds of cars parked on what once was a baseball field. The old will call ticket window a reminder of what once was. First look over the wall to see the field and stands. In 1984 the field was used for the Pan American games which where held in Indianapolis. After almost 60 years of being home of the Indianapolis Indians it was turned into a dirt race track for midget race cars. An was renamed the 16th street speedway. Bush stadium is now being rented by Pick a Part from the City of Indianapolis. Thats why there are cars all over what was the field. Bush Stadium is on the list of Historical places.An is why it is still in existence today. Both these photos are a look from behind the leftfield wall an the leftfield stands. This is a view of the stands and homeplate area photographed while standing on the roof of my truck over looking the left field wall. Before someone from pick a part approached me to see what I was doing. then I left. All facts and dates about Bush Stadium courtesy of wikipedia. After checking out Bush Stadium I headed to Downtown Indy for a little urban hiking. Her are a few places I past by on my hike. Lucas Oil Stadium Home of the Indianapolis Colts. I think they use this as a airplane hanger in the off season realy intresting looking building. This is the NCAA National Headquaters located just outside of downtown Indianapolis. This was the sunset while I was driving back to Denver somewhere in central Kansas. Normaly I am not a fan of driving through Kansas But This sunset on my way home was a incredible end to my trip. This was a great trip. I drove over 4000 miles in the 2 weeks I was gone. I visited 2 MLB Ball Parks. 3 Minor League Parks and caught 3 BP Baseball. Got to meet many players in both the Majors and Minor Leagues. I would like to Thank My Family and friends across the country that let me stay at there homes and/or got me tickets to games. Thanks to Viviene for letting me stay at your house both going to NY and heading back to Denver. Chris for getting me tix to the Indians game, Mike M in NY for tix to the 8/12 game, Rich Woodworth for getting me tix for the 8/10 game. The whole Gioia family for letting me stay at there house and for dealing with my crazy schedule while I was in NY. Everybody that headed to Millers Ale House to meet up with me even know I did not make it there. Catcha next time. My Next Cross Country adventure is in the planning stage and will take place at the end of June when the Rockies Head to The New Yankee Stadium. Thats unless the plans get postponed due to a new endeavors in life that may be taking place in the next few months. More info to follow. To All the Rockies Fans Keep Believing. I know I will.